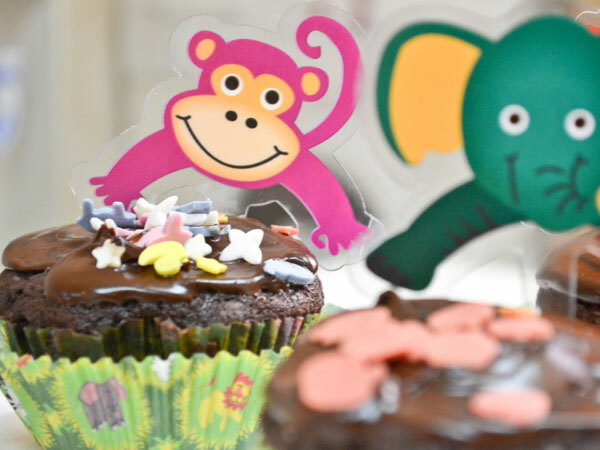 Though the summer holidays are long gone, it would unfair, if I didn’t do post on Mimi’s baking projects. The blueberry swirl cheese cake, ginger -orange cookies (whose pictures I do not have), Mimi -special marshmallow brownies and these chocolate cupcakes have been Mimi’s baking trysts. From an objective standpoint, I have to say, she is quite good and loves to get her hands dirty with flour, sugar, butter trio. It is a joy to see my 4 -year-old taking interest in baking. It makes baking extra special. There are many things that Mimi says which don’t register at that precise moment. Several days or even months later, an epiphany would come and with it such clarity. Mimi stopped going to school long before the term was actually over. Probably that school wasn’t right for her. Anyhow, the moot point being Mimi spent a lot of time home being pampered silly by her nanny ( when I was away at work) and by us ( when my hubby and I got back home from work). Not going to school had in no way stopped Mimi from learning new things, tricks and tactics. It is amazing how children are learning continuously without really being aware of the process. Somehow, it is us, the smart adults who think we know everything, thereby stalling the glorious process of learning. While she was at home, Mimi threw herself wholeheartedly into the solving her puzzles; starting from 10 pieces, 20 pieces, 50 pieces and now 100 pieces. This was her main activity during the day, from there on she would do some reading, pretend played with her stuffed animals, a tea party in the afternoon with her stuffed animals again, rode her bicycle in the house ( scaring the nanny by whizzing past her at lightning speed) and then finally waiting for us to come home from work. She would then run to us, all excited and happy and cling around my husband’s neck persuading him to take her swimming. On most days, she would already be in her swim wear eagerly looking at the door. Weekends were mostly about spending time playing and reading. At times we baked together and quite recently, Mimi has been baking all by herself. She took my help only to measure her ingredients. Otherwise she was handling her show quite confidently. 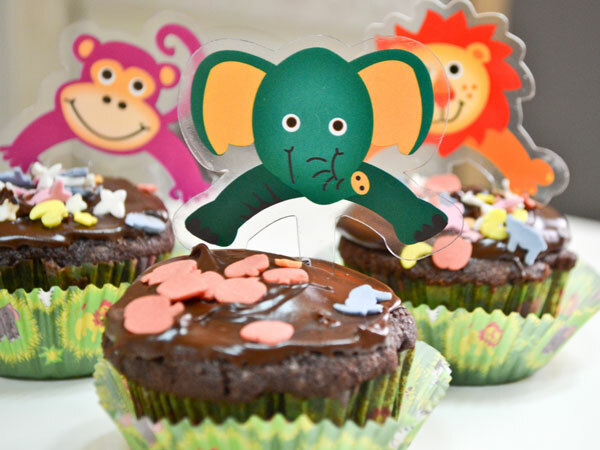 The chocolate cupcakes and the marshmallow brownies were completely her baked treats. They were scrumptious and delightful. I helped her melt the chocolate in the microwave and then finally pushed the cupcake tins into the oven. I have observed her enjoying the mixing and adding of ingredients. 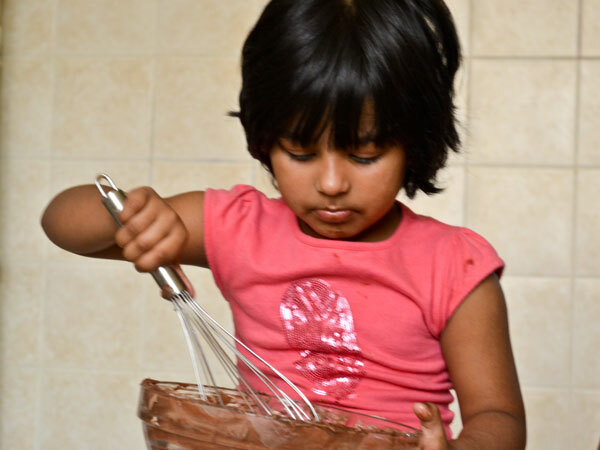 At times, she even tasted the batter and nodded her little head in approval. The batter -test is something that she is used to as I would always let her have a lick of the batter whenever I baked. Her reaction to the taste of the batter gave me a heads up about the end product. In that moment, I took some time to understand her question and then remembered feeling stumped. I did not have an answer. She continued with the buttering of the cupcake liners and then said, ” Mamma, cupcake is my favourite sunny spot.” That is when I understood what she meant by a ‘ favourite sunny spot’. I pushed it to the back of my mind and it did not come up until the day I was at sitting the porch of my parents home (India, Kerala), sipping on a late afternoon tea and watching the thick sheets of rain pouring around me. It was a moment perfect because of its stillness. There was nothing preceding or succeeding. Just a thought- less few minutes of listening to the rain falling on the roof and on the plants. A moment where I wasn’t thinking, analyzing or guessing. Only listening. And then I remembered Mimi’s question and now I knew the answer to that. This was my favourite sunny spot. A moment of perfect stillness. Nothing to cloud my vision except for the blanket of rain drops falling from the skies. Ironically, it wasn’t sunny. Far from it. But this was decidedly my favourite sunny spot – on my parents’ porch, sipping my warm tea, watching the rain. I called out to Mimi, who was busy watching “Chotta Bheem” on the telly. She came out to the porch, slightly annoyed with the sudden interruption. “What is it, mamma?”, Mimi inquired. “Mimi, this is my favourite sunny spot!” , I replied. She looked at me quizzically and then took off to continue to watch Chotta Bheem. 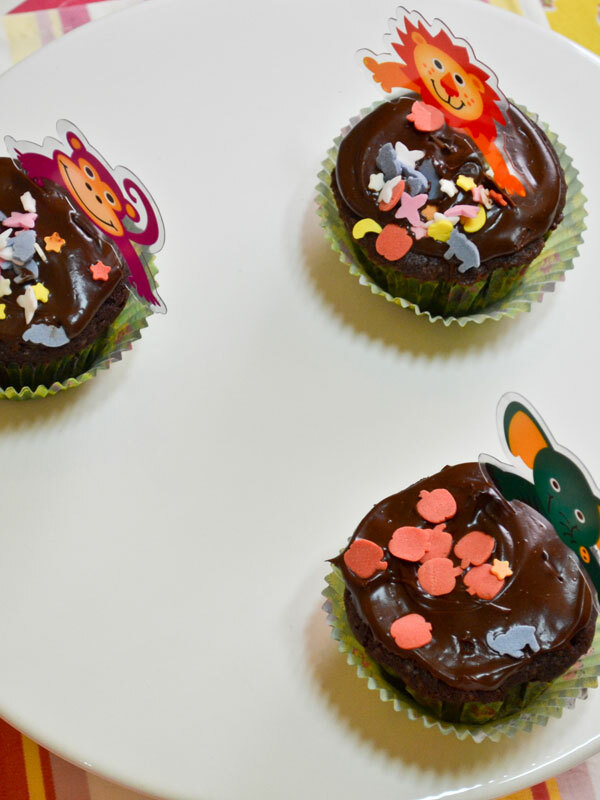 It is as simple as it gets but like all of Nigella’s recipes, these cupcakes are big on taste. 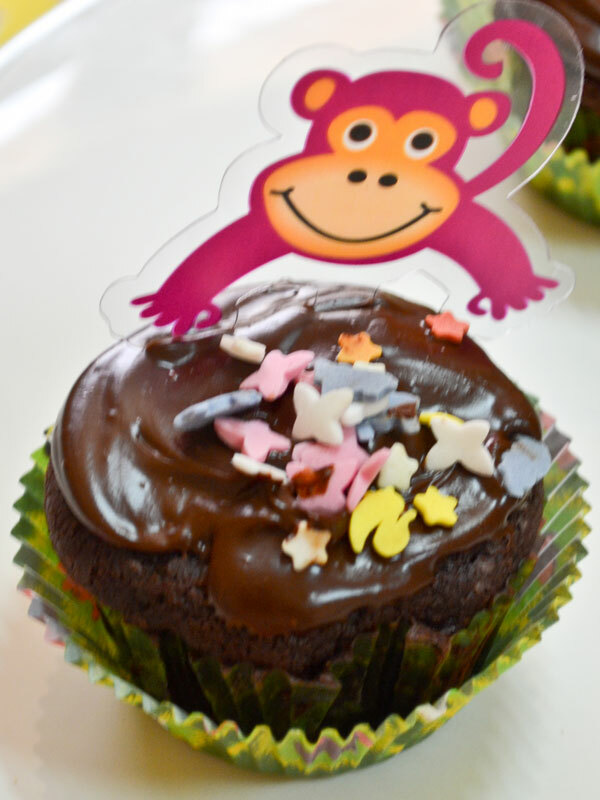 For Mimi, baking these chocolate cupcakes meant being in her favourite sunny spot and for me it was that exquisite moment of watching the thundering rain. What is your favourite sunny spot? Thanks Vinu. Glad you liked the post. You haven’t mentioned what is your fav sunny spot ? Beautiful post Anita! Lovely title 🙂 and the way you summed up the feeling of sitting in the rain….awesome! Unlike you I don’t have the apt words! All I can say I feel hugely fulfilled after reading this post. Love Mimi man! love her too much! 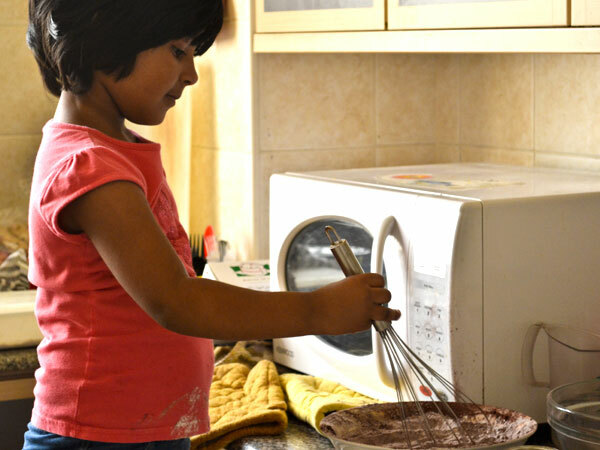 Oh I miss cooking with little ones….however now they are grown a bit they sometimes cook for me. Awww.. Mimi is such a darling!!! Solitude is my favourite sunny spot. I get to be me with no pretensions and protocols coming in between. Just me , my books and my world. my sunny spot… hmm… I think so that would be a freshly made pain au chocolat. She is already baking and cooking in her age? Your little girl looks like a future pro in this field, her cupcakes look better then mine. mud dumplings and ant & grass soup sound delicious, Helene. Thank you for your beautiful comment. I see that my daughter really enjoys baking ( with little assistance ofcourse) and also that she naturally takes to it. I hope your words come true. Inshallah! What a lovely post! Children have that breath of innocence, don’t they? “Favourite sunny spot” … it’s so sweet that this was her way of describing happiness. 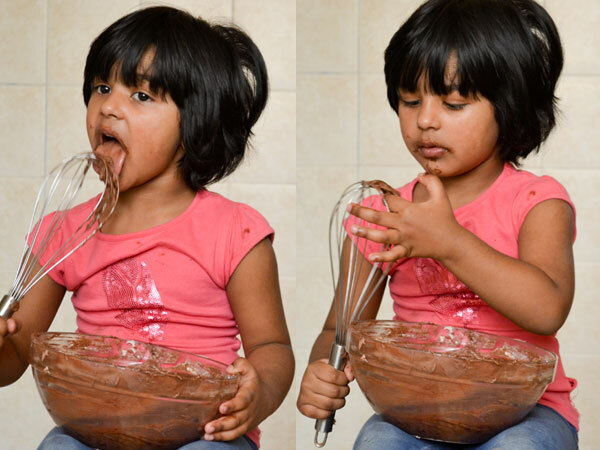 Love the photos of her licking the whisk!